In week two of “So You Think You Can Dance” (SYTYCD) season 15 auditions, the judges looked for more talented dancers in the city of Los Angeles, California. Some familiar faces returned for another shot showcasing improved dance skills. The good and bad news was that auditioning dancers would not have to go through a choreography round this season. However, that also meant that if the judges were that unsure about a dancer, they’d be going home. Where in previous seasons, the dancers would get a second chance by entering the Choreography round. Deserving dancers now go straight to the Academy. Tessa is 18-years-old from Hanford, Ca. Nigel liked that she’s humble and called her “brillant.” Vanessa said her movement was beautiful and graceful. Twitch called her “super-talented.” Mary called Tessa “extraordinary” and she “just has it.” Tessa got a ticket to the Acdemy. From Detriot, Michigan, Jay Jay is a Jazz dancer. His sister got him into dance as a child. He made it to the SYTYCD Academy last year but got cut in the Choreography round. Since then, Jay Jay has been touring with “Shape and Sound” working wth former SYTYCD contestant and now choreographer, Travis Wall. Nigel gave him an “A” and “A” for attitude. He described Jay Jay like a Scottish salmon swimming upstream. The judges were in agreement to send him to the Academy. Nathan and Courtland are best friends who met in a crew. They’re on a mission to inspire youth to “come up into the world” like they did. Nigel thought Nathan was “tremendous” and stronger than Courtland. He said he wants them to create signature moves because he’s seen it all befroe. Vanessa agreed and thinks they can come-up with something “super memorable.” Twitch advised Courtland to have his solo moment too like Nathan. Courtland thanked Twitch for being a big inspiration. Mary didn’t think the audition was “strong enough” and said they are super-entertianing. Vanessa voted “no”, while Twitch voted “yes.” Nigel held the deciding vote which was a “yes” for both of them to go to the Academy. More girls who performed Contemporary and went through to the Acadmey were: Sydney Moss, Chelsea Hough, Rebecca Troyak, and Dayna Madison. CJ is 20-years-old with the sadest story ever. He told the judges that he’s auditioning with his own Hip-Hop. Because he’s been through a lot. Twitch asked him about it. He opened-up that three years ago he witnessed him mom get killed by his Step-Father. He thought it was a nightmare that he’d wake-up from. His mom was his best friend and felt he had nothing to live for. That’s when he lost his passion for dance. But, soon realized that he had to go after his passion because there’s only so much time. Twitch thanked CJ for his bravery and turning the things he’s been through into something positive like dance because it’s inspiring. Twitch was very conflicted because CJ’s energy and passion “is fantastic.” But, is his ability enough to go through? Mary didn’t think so and agreed that his Hip-Hop isn’t strong enough and he needs more tools. Nigel said CJ was a little bit “uncontrolled.” He told him to reign it back in a little bit. In tears, Vanessa told CJ his is inspiring so many people to dance and it kills her that he had to go through that. After they told him “no” the judges gave him a mini-therapy session where they told him his mom’s death isn’t his fault. Twitch pushed him to go out and inspire others. Twitch sid SYTYCD has done a lot to the awareness of Hip-Hop and it used to be a very underground situation where you really had to be intiated in order to really know what’s going on. Not the case anymore! Dustin is a 26-year-old animator dancer from Columbus, CA. Last year after he made it to the SYTYCD Academy, he got cut in Ballroom. Having a full-time 9 to 5 job, he practices dance on his lunch breaks. Twitch called him a “prime example of how a hip-hop dancer can comeback evolved.” He also added that Dustin had enough patience to follow-through in his moves and he’s confident. 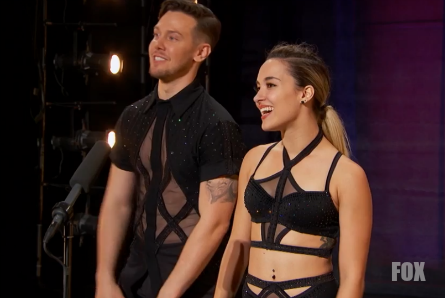 Mary called Dustin “mesmerizing.” Nigel called Dustin “a very smart dancer” and hopes he’s been working on his ballroom and everything else and would be good to see him do well on SYTYCD. Dustin went through to the Academy. Nicole brought back a familiar face to her audition. She’s 20-years-old from Highland, Ca. She auditioned with a past season 2 Sytycd winner Benji Schwimmer dancing West Coast swing. She trained with his father Buddy Schwimmer (the King of Swing) then started training with Benji whom has now been her dance partner for three years. Vanessa called the routine “absolute fire.” Twitch said there’s something to be said to be on stage with Benji and they’re watching her. When Nigel asked her what other styles she’s trained-in, Nicole answered that she’s also trained in ballet, jazz, hip-hop, contemporary all to supplement West Coast swing. She’s also trained in ballroom, Latin, and tap. Nigel called it the best West Coast Swing he can remember seeing. Mary noted that it’s not the same West Coast Swing from even five years ago. So, Nicole is making a huge transformation and asked if they’ve won the U.S. Open before. Nicole said they won the U.S. Open three times. Mary told Nicole that she’s taking the dance to a whole other level. Nicole was estatic and even more so when she got the golden ticket to the Academy. 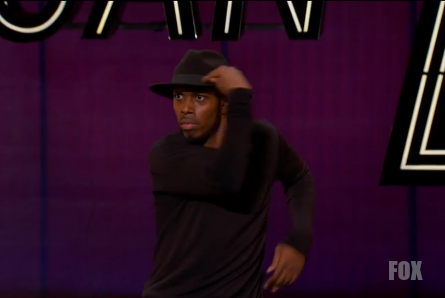 NEXT WEEK: “So You Think You Can Dance” will audition dancers in New York.